Asthma, a chronic inflammatory disorder of the airways, is one of the more prevalent chronic conditions in Canada1. 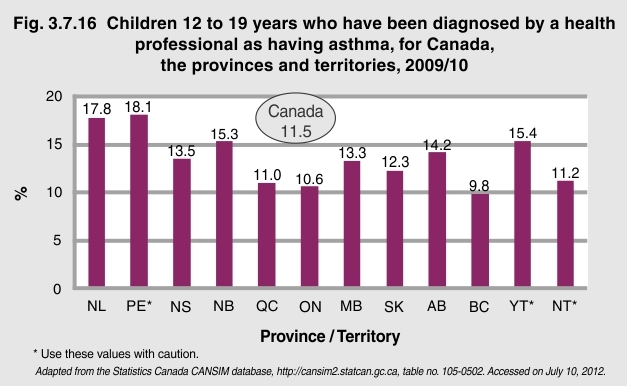 According to the 2009/10 Canadian Community Health Survey, 11.5% of youth 12 to 19 years of age were diagnosed with asthma by a health professional. After cardiovascular disease (34%) and cancer (29%), chronic respiratory disease is responsible for the greatest proportion of chronic disease deaths in adults (4.3%) in Canada1. 1Gershon, A., et al., (2007). ICES Report: The burden of asthma: can it be eased? Accessed on May 28, 2012, at http://www.longwoods.com/content/18644.